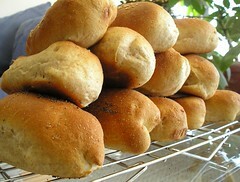 Hot dog buns - Do You Know The Muffin Man? Notes: Made using the Light Wheat Bread formula. Proofed very quickly since it's so warm today. Poor shaping produced unevenly sized buns.